Vampyr, announced early this year by Life is Strange developer Dontnod Entertainment, is built on the kind of concept that grabs my attention immediately and forcefully. You'll play as a doctor in London shortly after the end of the First World War and in the midst of the flu pandemic that would ultimately kill as many as 100 million people worldwide. But you're not just a doctor; you're also a vampire. But neither are you just a vampire, according to a (slightly) closer look at the game posted on the PlayStation Blog. The lead character, Jonathan Reid, remains close enough to his humanity to remember what it's like, and while Game Director Philippe Moreau said that won't necessarily make him "good," he is influenced by his deep skepticism of all things supernatural. "A rational man, Reid wants to come to terms with vampirism—he wants to understand it," Moreau wrote. "Basically, he wants to treat it as a medical condition, but as you play through the story and meet many of the characters in the game, you’ll discover that things are much more… organized, or deliberate, than that." 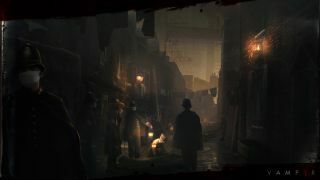 The developers have researched how the pandemic impacted London, as well as the state of medical and scientific knowledge at the time, but the in-game city will be built on both factual and fictional reference material to properly capture the "feeling" of an era when superstition was on the decline, but still hanging strong in some quarters. But it sounds like the real hook will be player choice. "Killing innocent people is unfortunately the price of immortality. Besides, in the eyes of a vampire, how do you define innocent? You’ll have to kill people, that’s for sure… but how do you decide who?" Moreau wrote. "The information you gather, the things that you see, and the relationships your nurture will all define your decisions. But you will have to feed. You cannot escape that you are a vampire." The blog post contains a few pieces of concept art, and Moreau said proper in-game assets are on the way. Vampyr is currently expected to be ready for release in 2017.